Marsimartnan Winter festival in the wooden city of Levanger is a traditional market not to be missed. Marsimartnan can be traced back to the Vikings and is built on traditions, quality, culture and history. The town centre is filled With traders and visitors from far and near. Experiences include local Food and beverages, exhibitors, concerts, museums, fair ground, the historic Sjøgata and much more. 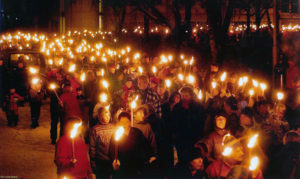 The highligt of the market is the torch parade on Friday night where the Whole city centre goes dark and the town is set in a magical atmosphere. 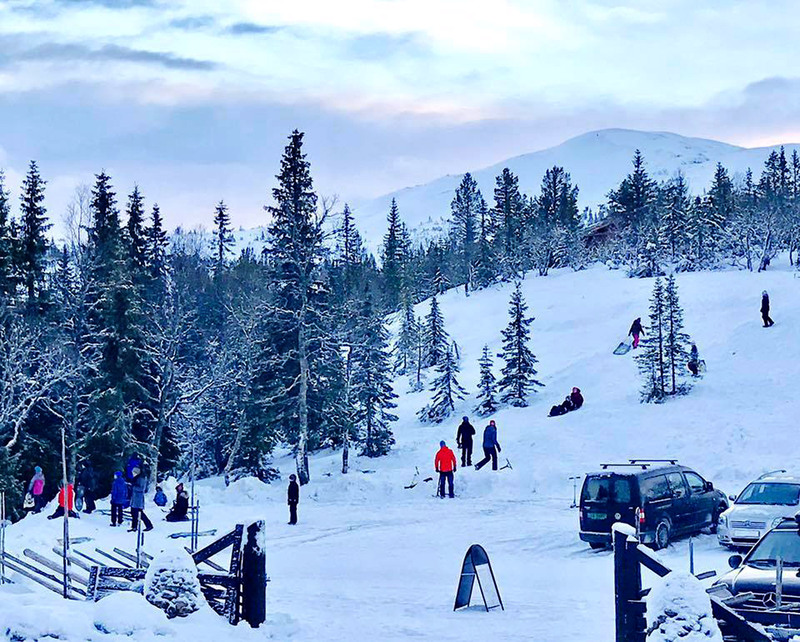 Skallstuggu Lodge is situated in scenic surroundings about 20 km from Levanger city centre and is a wonderful starting point for Winter activities like, cross country skiing in the many prepared ski slopes in the area, sledding, ski mountaineering (randonne) etc. The lodge is located 440 m.a.s.l with excellent parking opportunities. Vulusjøen lake is just 150 meters from the cabin. Open in the weekends for dining, unless hired out for an event. Follow Skallstuggu on facebook for updated opening hours. Tired of skiing? Why not try something new! Slip on some snow shoes and explore the nature by foot. This is a good alternative to hiking and randonne without skis in the winter. 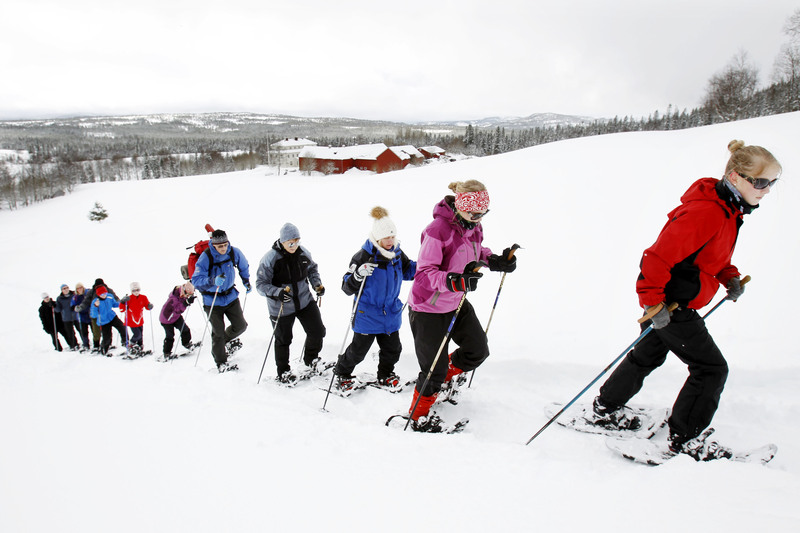 Snow shoes are easy to use and suitable for kids and adults alike. Mokk Gård in Steinkjer, on the border of Blåfjella – Skjækerfjella National Park, offer guided snow shoing tours in the beautiful terrain around the farm. The tour can be conducted during the day, at twilight or in the evening With a head lamp. Mokk farm also offer accommodation and dining. There are many great ski slopes in Innherred. er mange flotte skiløyper på Innherred. Whether you embark on a leirsurely skiing trip to enjoy an Orange in the sunshine or want a proper workout, there are km after km of prepared ski tracks available to you in Innherred. During the Winter season, there are groomed trails near virtually every village, and some of the trails are also lit at night. Are you tempted to do embark on a mountain trip in the Winter? Snåsa Fjellstyre have 12 cabins for rent with attractive locations in the Snåsa Mountains. These cabins are excellent starting points for hunting, fhishin and hiking, both during winter and summer. These are self-catering cabins that have to be pre-booked. Steinkjer kommuneskoger – Ogndalsbruket KF have 3 cabins for rent all year – all fully equipped self-catering cabins. Fancy a mountain trip with luxurious overtones? Ismenningen Lodge and Hytteutleie is a fabulous traditional timber lodge in the Snåsa Mountains. Are your skis demanding a mountain hike – over plains and frozen lakes? Take a trip to Norway’s geographic midpoint and “feel” the Blåfjella – Skjækerfjella National Park. Hike from cabin to cabin and experience the perfect winter landscape, mountains, lakes and hiking. Whether you enjoy going alone or with family and friends, an overnight trip to Skjækra offer fantastic nature experiences. 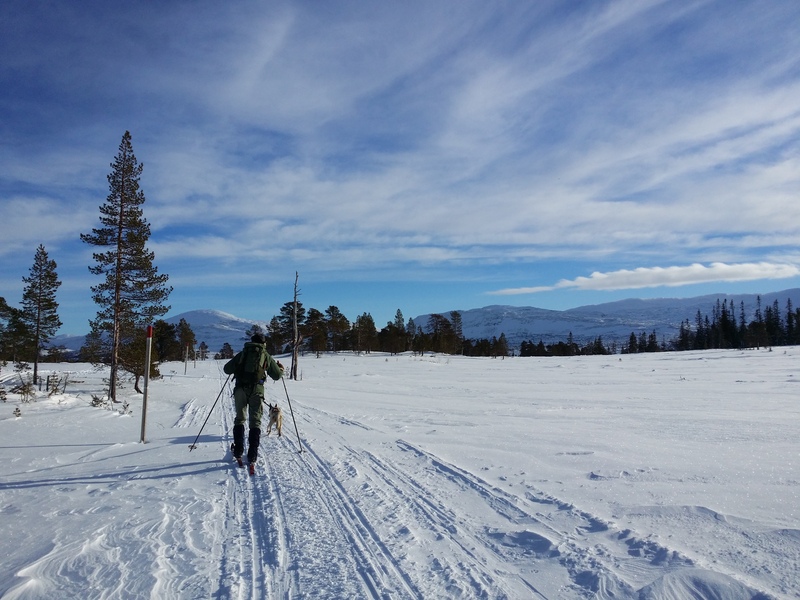 Read the tour description of this cabin trip to Skjækra and Norway’s geographical midtpoint. Read about ice fishing in Skjækra. If you want to experience staying in a cabin that is somewhat unusual, we highly receommend Spettspiret at Letnes Farm in Inderøy. Spettspiret is a cabin in the tree-tops, hidden away from the everyday stress of life. Imaging enjoying the fantastic view over the Beistadfjorden and relaxing in the hot tub outside in among the Winter scenery! Dog sledding is a fantastic activity that can give you a lifetime of memories. You get a real sense of speed and a wonderful nature experience simultaneously. Snow, wind and noises come closer when you are hurtling across the snowy landscape behind 4 legged happy huskies. Whether you are a family, group of friends, or a small business that fancy an exciting wilderness experience, dog sledding can really be receommended. Sporbryter Sledehundekennel in Steinkjer offer everything from day trips to 8-day trips in and around Blåfjella – Skjækerfjella Nasjonal Park. 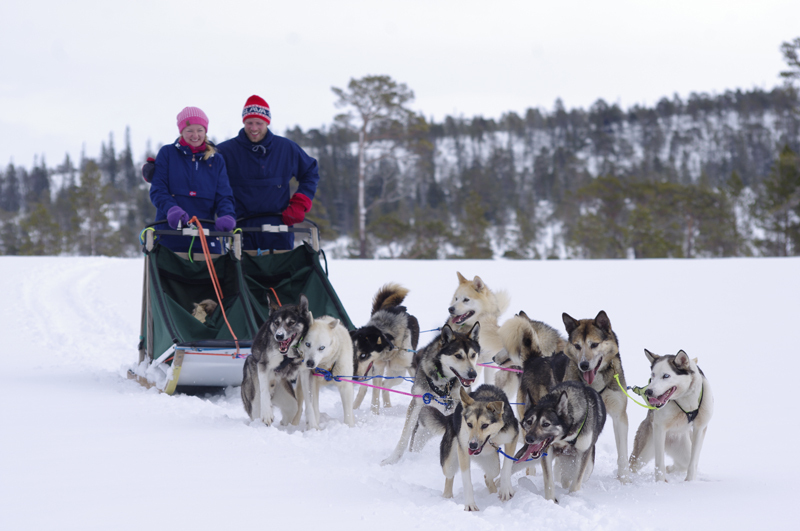 Sitting in the sled or steering it, this is an Activity you are sure to want to experience again! Innherred has numerous beautiful lakes in which to indulge in some Fishing. You can fins in lakes up in the Mountains, near roads or on the fjord. 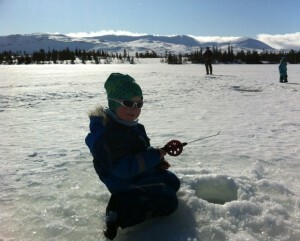 Recommendations for fjord Fishing in the winter is i.e. Verrabotn or Beitstadfjorden. 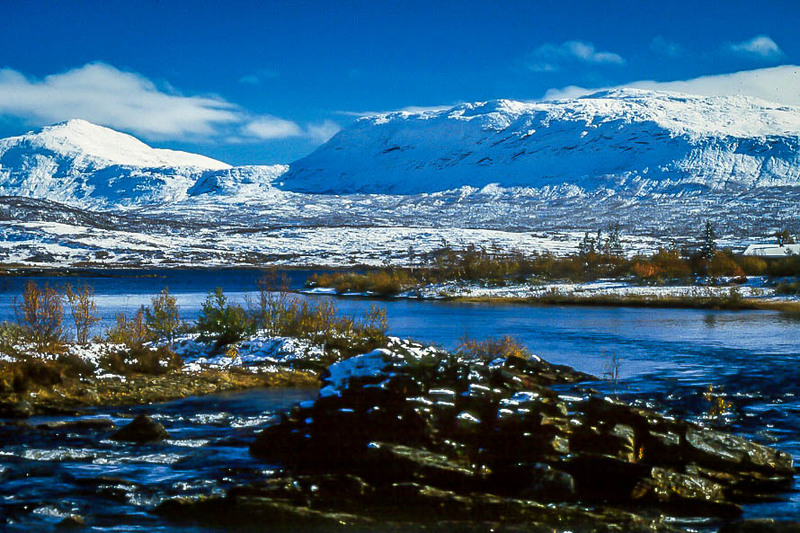 The beautiful scenery at the borders of Blåfjella-Skjækerfjella Nasjonal Park is perfect for ice fishing. Make an adventure by staying 1 or more nights – Several cabins for hire are available with access to excellent fishing lakes and great ski terrain nearby. Snåsa municipality boasta more than 2000 small and large Fishing lakes, and a great number of those are suitable fir ice fishing. 1 Fishing License gives you Access to all of those lakes. 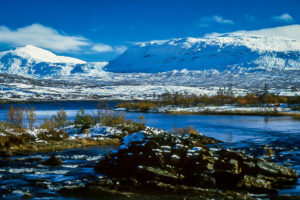 The 3 most popular are Lake Grønningen, Lake Langvatnet and Lake Heggsjøen, all reachable by car. Both Trout and char are among the catches in these lakes. The ice has settled on the lakes, it is cold and a wonderful time to be outside. Bring your friends and family to go skating on frozen lakes. Light bonfires on the lakes edge, relax and enjoy the beautiful scenery. Many schools in the district put ice on an area at school. Some other tips are Lake Lustadvatnet in Ogndalen, Steinkjer, Lake Granavatnet in Inderøy and Lake Snåsavatnet. If you do not have skates, you can perhaps use a kicksled! Lykkeland, Steinkjer – Lykkeland is an indoor play area filled with physical challenges for children of all ages. Laserland, Steinkjer – North-Trøndelag’s first and only indoor lazer tag game suitable for everyone from 8 – 100 years old. Dampsaga Bad og Gym, Steinkjer – Treat your family to a day at Dampsaga Bad and play in the water with slides, activity pool and jacuzzi and much more. Steinkjerhallen, Steinkjer – Challenge yourself on the climbing hall and the bouldering room at Steinkjerhallen.